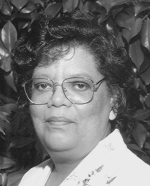 Cynthia A. Wilson is a former Co-Chair of Black Genealogy Research Group of Seattle and former member of the board of directors of Black Heritage Society of Washington, Inc. The history and genealogy of African American residents of Patrick County, Virginia, have been her principal area of study. Currently, she is concentrating her research on black civil war soldiers who found their way to Seattle. She self-published a compilation of slaves names from Patrick County court records and has published articles in the Afro-American Historical and Genealogical Society Journal.